Advance Your New Testament Study with this Up-to-Date and Critically-Acclaimed Four-Volume Dictionary Collection! 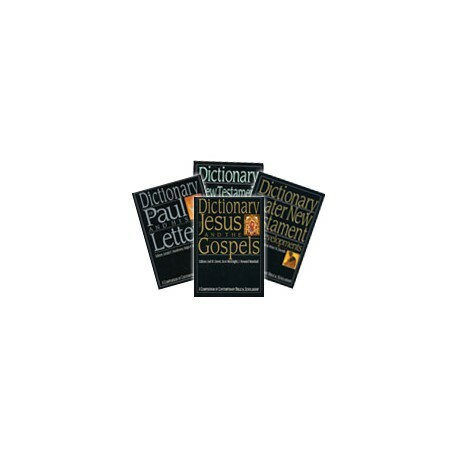 Advance Your New Testament Study with this Up-to-Date and Critically-Acclaimed Four-Volume Dictionary Collection! The four-volume New Testament Dictionary Collection from InterVarsity Press provides an extensive and fascinating study of the events, people and social climate surrounding the life of Christ and founding of his church. Here is an Entire Library of New Testament Scholarship You Can Use Every Day Hundreds of in-depth articles from hundreds of expert scholars around the world will inform you on perennial topics and timely debates concerning the Gospels, Acts, the epistles and Revelation. As a collection, these dictionaries will aid your study and research, equip your preaching and teaching and enrich your understanding of the New Testament. The Dictionary of Jesus and the Gospels is unique among reference books on the Bible. It is considered the first major new work in this area since James Hastings' 1909 publication of the Dictionary of Christ and the Gospels . In the more than nine decades since Hastings, new interpretive methods have illumined the text, and the ever changing profile of modern culture has posed new questions to the Gospels, and our understanding of the Judaism of Jesus' day. Background topics (such as apocalypticism, Hellenism and Qumran Other subjects specifically relate to the scholarly study of Pauline theology and literature. Separate articles are devoted to each of the Pauline letters, to hermeneutics and to preaching Paul today. The Dictionary of the Later New Testament & Its Developments provides focused study on the often-neglected portions of the New Testament: Acts, Hebrews, the General Epistles and Revelation. Its scope goes beyond the life of the New Testament church to include the work of the Apostolic Fathers and early Christianity up through the middle of the second century. Wide-ranging articles span the books of James and Jude to household codes, from the Roman emperor cult to Gnosticism and Docetism, questions of canon to second-century church leaders such as Ignatius and Polycarp. The Dictionary of New Testament Background is the most recent addition to the collection and takes full advantage of the flourishing study of the Dead Sea Scrolls offering individual articles focused on the most important scrolls. Articles abound on aspects of Jewish life and thought, including family, purity, liturgy and messianism. Greco-Roman culture is displayed in articles ranging across language and rhetoric, literacy and book culture, religion and cults, honor and shame, patronage and benefactors, travel and trade, intellectual movements and ideas, as well as ancient geographical perspectives. If you already own the three-volume New Testament Dictionary Collection , please call 1-866-722-4253 for pricing on the four-volume update.